A relief printmaker, I specialize in nature printing: using the actual organism (fish, fern, octopus….) to create the image. Once I have my original prints to work with, II use mixed media collage techniques with encaustic (melted beeswax, tree resin, and pigments) to create light filled environments for my one-of-kind images. I have been a proud member of the Nature Printing Society since 1997. New work! This piece, leading the slideshow below, began with a market purchased squid, more than 2 feet long. I made several prints from the squid (squid, by the way, are harder to print than octopus – they tend to release more of their own bodily fluids into the process), including several "impressionistic" images on tissue paper, perfect for layering into encaustic. This piece, presenting the middle section of my original subject, is only 8 inches square. My intent was to give the impression of a shy cephalopod exploring the murky depths, verging toward the abstract. Most of my pieces have a "back story." Many, but certainly not all, the stories involve a fishing trip. 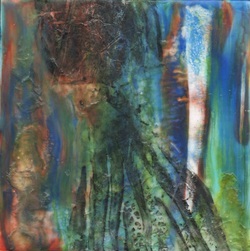 Like the encaustic process itself, bringing the subject matter to its new life as art draws on many layers of experience, meaning, and technique. Two Little Rockfish, 18" x 12"
This fish is a wonderful little Quillback rockfish that I caught on a trip home to Ketchikan in 2011. I treasure the three fish I caught that day, and have printed them many times. They reside, carefully wrapped and labeled, in my fish freezer between printing sessions. The piece is truly one-of-a-kind because I don't know how I achieved the bubbling effect with the encaustic. I think it was a mix of pigments that weren't entirely compatible. All I know is it suddenly looked like this and I turned off my torch and called it done. It was one of my entries in the 2012 North Clackamas Art Guild annual show, where it received Best of Media Group in Other Media (ribbon upper left). It has been purchased. First a lovely 17" Koi was salvaged from a sad event, a "die off," in a backyard pond belonging to the friend of a friend. My friend, Betty, happened to be an avid nature printer. Betty called me excitedly with the news, "I have a fresh Koi!! ", and we met at my studio for a session of gyotaku with our favorite inks and paints and an assortment of papers and fabrics. We worked for several hours, and made quite a few images. Some of those Koi images stayed with me through a move to a new home and studio. There, several years after the initial printing session, I gathered some leaves and brought them home for a morning of botanical printing. By that time, I had discovered encaustic. I glued a heavy layer of linter (pressed cotton fiber normally used for papermaking) to a 24" diameter 1/2" plywood board and then applied many layers of encaustic, incorporating the Koi and leaf impressions. Heat, via torch and heat gun, was used to fuse each layer to the one below. Warm wax became cool water, leaves floated to the surface, and Koi was home again.